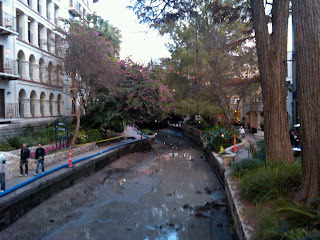 Not what you remember the River Walk looking like, right? Well, for about 12 days each year they drain the River Walk to clean it up and dredge some of the dirt, trash and rocks that settle in it throughout the year. 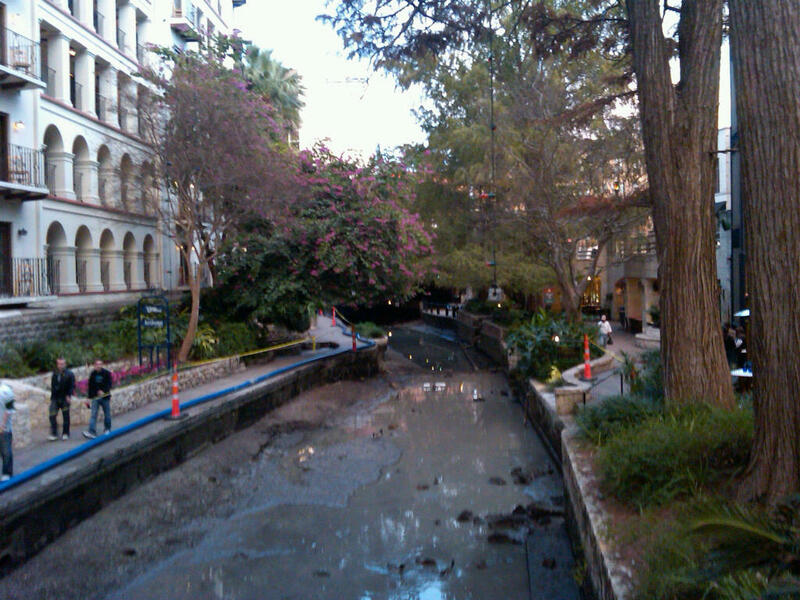 Nothing like strolling down the scenic River Walk to the sound of heavy machinery, smell of diesel fuel and the worry that you might trip over a large blue hose full of San Antonio river water! I think the River Walk being empty is a great visual - perhaps a metaphor - for business travel. You go to a great city expecting to see the sights (not really but that's what everyone else thinks you do when you travel for work) and instead you sit in a meeting room for 8-plus hours a day for two days and then fly home. Empty River Walk equals drab meeting room! See how I linked them...you were worried, huh? Now, I'm not saying that I didn't get out and see anything while I was in San Antonio (more on that in a bit), I did and there was a Starbucks right across the street so it was a good trip for me. 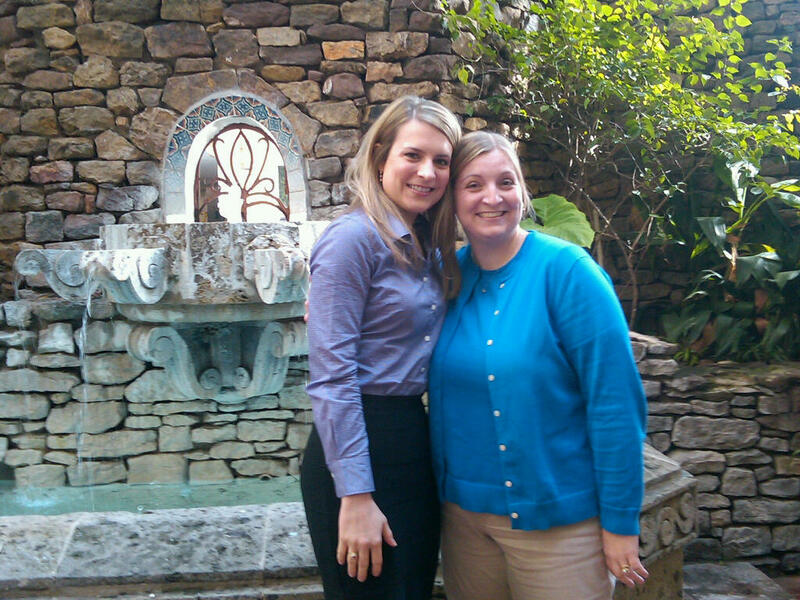 I also met 12 women who really inspired me (really 14, but I already knew two of them before I went) during the trip. I was at a meeting with a group of farm women. That is such an insignificant description of these women. They are wives, mothers, daughters, sisters, teachers, business women, and so, so much more! They are intelligent, passionate, compassionate, funny, witty, engaging and just downright FUN. Though they are from five different states and had never met before, by the end of the two days you could tell that some wonderful friendships had been formed. I just sat back and listened (OK, I talked a bit too) to the stories about why they farm; how they met their husbands (at the lake one summer for one gal and online for another); how they adopted not one but three beautiful boys from Russia - the last one right before Putin stopped adoptions to Americans; how they asked their teenage children what they liked and didn't like about the farm (liked living in the country, disliked living in the country...teenagers! ); how their husbands promised them they could take vacations WHENEVER because they don’t have livestock but forgot to mention planting in spring and harvest in the fall; how their lives revolve around their animals because it doesn't matter if it's Christmas, the cows need fed and milked; and how they couldn't imagine living and raising their families any other way. I'm privileged that while I no longer live on my family farm, I get to work in the presence of farmers, like these women, and do my small part in helping them (and their families) continue to do what they love to do - grow stuff, whether it's plants (corn and soybeans here in Indiana) or animals. Getting to know these women really made the trip for me. 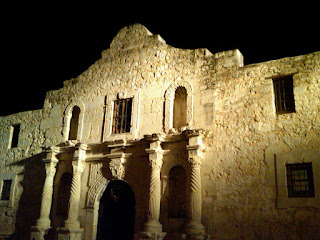 I did manage to snap a few more photos on my trusty Blackberry while I was down in Texas and they even turned out OK since I solved the mystery of the blurry photos. I mainly took these pictures to post to Twitter during my trip. I don't know why, but I really immersed myself in the Twitterverse last week! 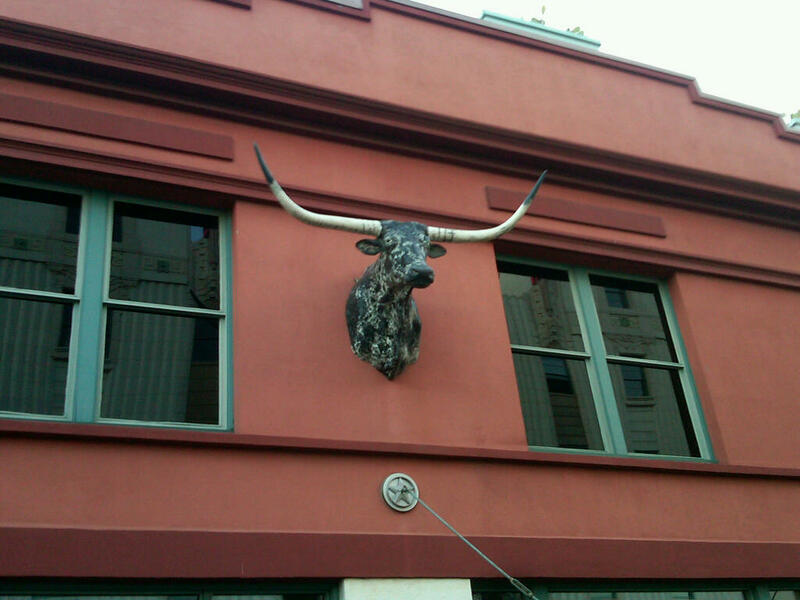 So here's a "snapshot" of my San Antonio trip. 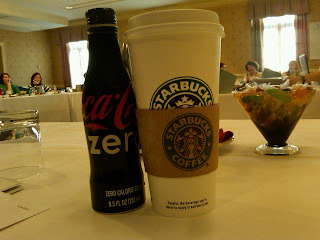 OK, maybe this isn't what you expected but that's just part of my caffeine consumption during Day 2 of the meeting. I truly appreciated the Coke Zero in the meeting room. It was a great chaser to the Venti Starbucks I consumed that morning! There might have been a few other bottles of Coke Zero that didn't make the shot. What did you expect to see? 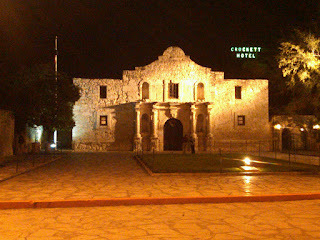 The Alamo? Mariachi Bands? Only in Texas (and maybe Mexico) can you see this on the side of a building! Unfortunately this next establishment was closed...really could have gone for a plate of pasta served by a belly dancing jazz musician! On my second morning in San Antonio, I got up early (Central time kills me) and took a walk along the River Walk (after hitting Starbucks) but had to detour because of the work being done so I took to the streets and realized that my hotel was just about 4-5 blocks from the Alamo! So after dinner that night, I walked back to see it lit up at night. Very cool. 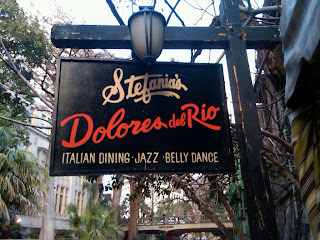 We ate at a barbecue joint along the River Walk just before my walk to the Alamo and this sign made me feel right at home. 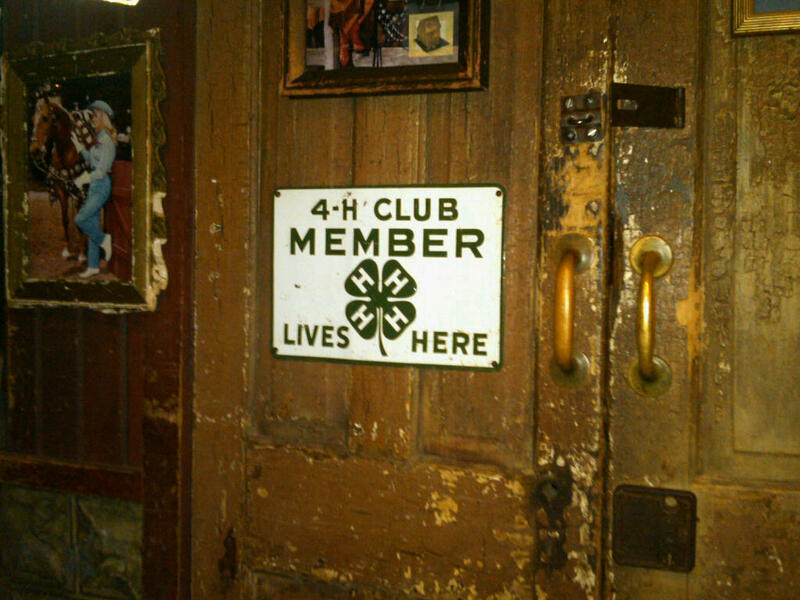 Shout out to all the other 10-year 4-Hers out there! 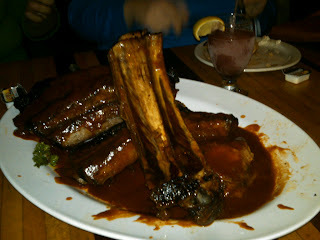 Do you know what went through my head when I saw these...the opening to the Flintstones cartoon when they brought out the huge dinosaur (assuming they were dinosaur) ribs to Fred's car - that and the Jetsons theme song, not sure why the Jetsons...Meet George Jetson, his son Elroy! The ribs were huge and I have to admit that these were almost too big to enjoy...though the BBQ chicken was yummy. 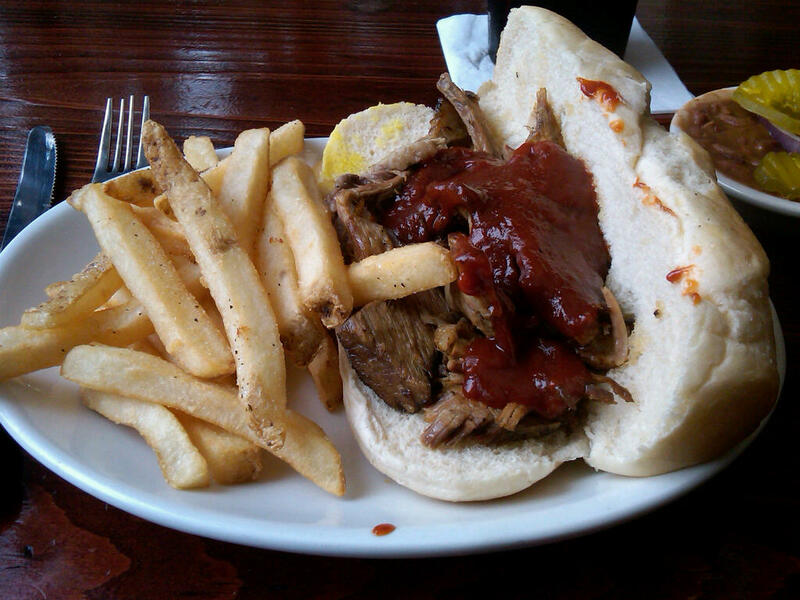 I think I have an obsession with food...took another photo of another meal. This time it was beef brisket and it was quite yummy. Now you know why I got up and took that morning walk, huh? 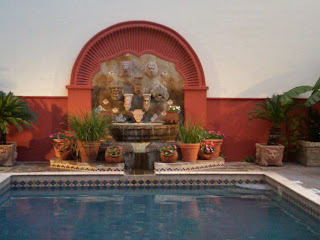 Here's a shot of the beautiful pool at the hotel that was actually warm enough to swim in, though no one did while we were there! 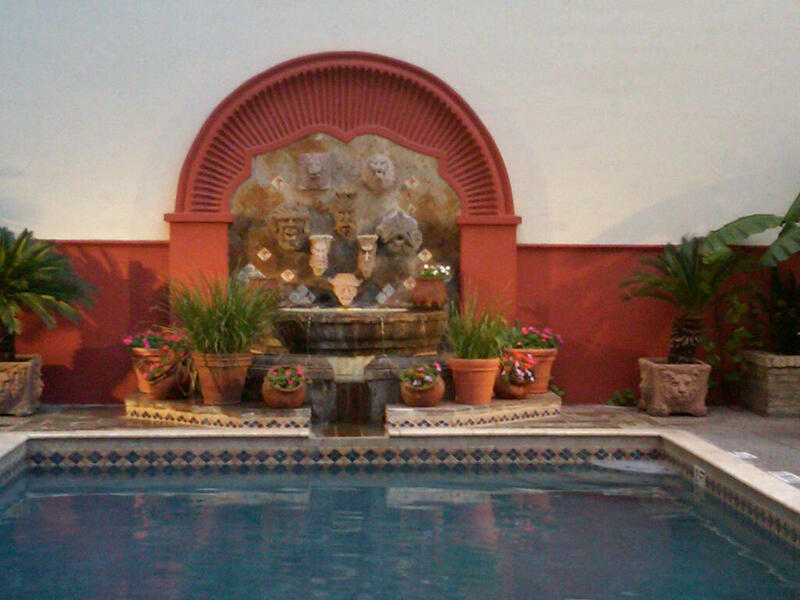 Since the hotel used to be a school, it's shaped kind of funny with all of these nooks and crannies. There was this cute courtyard close to my room and I snapped a shot of the two Hoosier farm wives that were at the meeting with me. They are such fun! And thank goodness the lady in blue above was with me...we had a 5:40 AM flight home and if she didn't call my room at 4:15 AM and ask me if I was joining her in the cab, I'd still be in San Antonio! 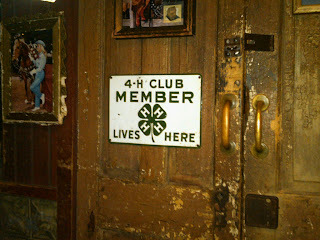 So, maybe I should add helpful to that list of adjectives describing the farm women I was with in San Antonio! I would have never left you there. Even if San Antonio wasn't as beautiful as we remembered, this was a great post. Thanks for everything!